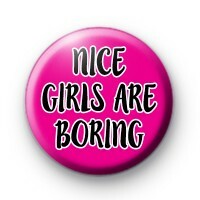 Pink, Black and White Nice Girls are Boring pin badge. This is a 1 inch badge that would be perfect to wear in response to Donald Trump! Stand united and stronger together. Feminists all around the world protect women's rights.